What issues of existing products does SCADA-Aware Mobile solve? 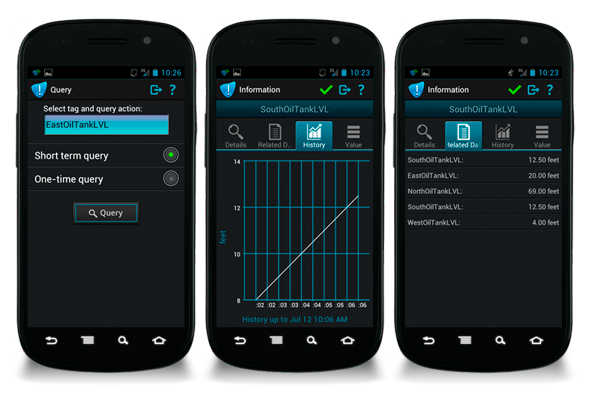 How is SCADA-Aware Mobile more reliable? Unlike SMS or e-mail alarm delivery, SCADA-Aware Mobile does not depend on third party services for which performance guarantees are not available. Unlike SMS or e-mail alarm delivery, a SCADA-Aware Mobile client positively and promptly confirms to the server than an alarm update has been successfully received. 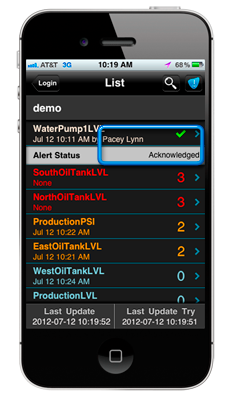 Unlike voice, e-mail, or SMS-based alarm delivery, a SCADA-Aware Mobile client application lets the user know when alarm updates won’t be received as expected, enabling the user to take action to resolve the problem. The SCADA-Aware Mobile server application will raise and deliver an alarm when a user is unable to receive alarm updates, something SMS and email delivery systems cannot do. The server processes and delivers such an alarm exactly like one received from the SCADA system. The SCADA-Aware Mobile server will raise and deliver an alarm when a problem occurs that negatively impacts alarm processing and delivery. Examples of such problems include loss of connectivity to the SCADA system, loss of connectivity to the historian, or an alarm that could not be delivered to any user. How will SCADA-Aware Mobile save me money? Why can’t we just use SMS and pagers? How is SCADA-Aware Mobile better than browsers? Browsers require you to be connected to the Web to see the SCADA data. With SCADA-Aware Mobile, you get historical and related data on the phone, and it stays on the phone even if you get disconnected. Unreliable network becomes less of an issue. Browsers can’t use GPS to check your location. SCADA-Aware Mobile can. How does SAM provide more “actionable awareness” on alarms? The Client receiving an alarm will ALWAYS generate an automatic positive acknowledgement to the server, an event recorded in the audit log. The Event Server records in the audit log each time an alarm update cannot be promptly delivered to a Client. If the Event Server detected that an alarm cannot be delivered to any Client, the server generates a system alarm that is normally configured for delivery to supervisory team members. The audit log contains a record of each of these system alarm events. Default reports provide detailed information on each alarm’s lifecycle. For example, if an alarm arrives from the event source at 1:20 p.m. and is acknowledged by someone at escalation level 3 (the highest level) at 3:47 p.m., a customized report can be generated showing for that tag that contains the following information. This level of detailed reporting enables managers to examine the effectiveness of his or her team in responding to alarms. Overall, the detailed alarm history created by the SCADA-Aware Mobile server contributes to the reliability of the entire solution, and gives relevant personnel important control over, and awareness of, system performance. SCADA-Aware Mobile helps solve his problems. When he gets the alarm notification, he can query related tag values as well as historical information right from his smartphone. Related tags indicate the skillset required to address the alarm. Historical data will provide a level of urgency depending on how quickly the threshold values are changing. With this additional information, the alarm can be acknowledged and informed next steps can be determined (including who else to contact, if needed). Other individuals who received the alarm notification will get an update of who has taken ownership of the event. Sending a field service engineer on site is costly to the organization. SCADA-Aware Mobile helps minimize the number of trips to the site, improves on the accuracy of the skillsets needed to resolve the issue, and reduces the organization’s overall cost. Reducing these risks also improves the safety for the impacted employees. How does the ownership visibility help? When someone acknowledges the alarm, it’s reported and recorded in the SCADA system. If the alarm was sent to other people, they will also see that acknowledgement, and will know who now “owns” the alarm. How will SCADA-Aware Mobile help me with unreliable network connection? How does the push-pull technology work? If the server cannot “push” the notification alarm to the right person’s mobile device, then the device will “pull” it from the server. The mobile device checks with the server for alarms in defined time intervals. This technology is based on the patented capabilities of Voyager, our middleware software. How does the GPS-based alarm delivery work? For each possible tag group or user group, a geo-fence can be defined (for example, a 5-mile radius around the event location). When that alarm goes off, designated personnel within that geo-fence get the alarm. If none of them acknowledges the alarm, then, after a defined time-period, the alarm escalates and goes beyond the geo-fence. This ensures faster response and eliminates duplicate action. However, if the manager of the designated personnel (for that alarm) wants to see the alarm even if (s)he is outside the geo-fence, that can be configured into the system. The GPS-based message delivery and peer visibility of alarm acknowledgment ensures that your personnel won’t get distracted unnecessarily, and it will save on overtime and vehicle gasoline cost. SMS, Pagers, laptops, and browsers don’t use GPS (location awareness) to determine notification recipients. What happens when the intended person does not respond to the alarm? The alarm gets escalated. There are three levels of escalation following the initial alarm. At each level, previous recipients can also see the escalation and details. How are things actually automated through SCADA-Aware Mobile? When an alarm goes off, someone in the control room doesn’t have to make any calls. In fact, no one has to man the control room all the time to check if there’s any alarm, or anything that requires the generation of an alarm. Once logged-in, you can stay so indefinitely. Even if your device is turned off, you’ll be considered logged-in. However, if your device is not available to receive alarm when it should be available (for example, it’s turned off or you’re outside the geo-fence or network), an automated alarm is sent out. What information is recorded following the alarm for audit purposes? How are redundant servers handled? We utilize Microsoft’s Windows Server Failover Clustering (WSFC) functionality. This provides local high availability through redundancy at the server-instance level—a failover cluster instance (FCI). An FCI is a single instance of SQL Server that is installed across Windows Server Failover Clustering (WSFC) nodes and, possibly, across multiple subnets. On the network, an FCI appears to be an instance of SQL Server running on a single computer, but the FCI provides failover from one WSFC node to another if the current node becomes unavailable. How is unreliable network coverage handled? We review the coverage by different carriers in a given area. If we find significant coverage differences between carriers, we suggest remedial actions, such as power/carrier boosters for vehicles. Small pockets with no coverage is not a big issue for SCADA-Aware Mobile. Usually it only needs edge network capabilities to connect. Since the amount of data transmitted for SCADA-Aware Mobile is usually small, the connectivity window does not need to be long. It’s different from e-mail/web browsing, which often does not work reliably and transmits much more data. How is the mobile device and user authenticated? When the user launches the client, they are prompted for a username and password. This can be authenticated against an OpenLDAP / Active Directory server. The username and password can alternately be locally authenticated in the application and stored in the event server’s database. If this method is chosen, the password is stored in encrypted form. Transmission of password information does not occur in clear text. While the device id is transmitted, it is not used for authentication purposes. The device id is used to distinguish devices when the user is concurrently logged in. Will I have to change my existing SCADA system to implement SCADA-Aware Mobile? No. Existing SCADA systems don’t need to be changed. Recursion will, however, need to update the SCADA database to incorporate our one-button acknowledgment. 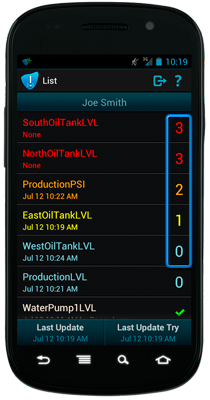 How is tag info transferred to the SCADA-Aware Mobile system? Bulk import done during commissioning and startup. 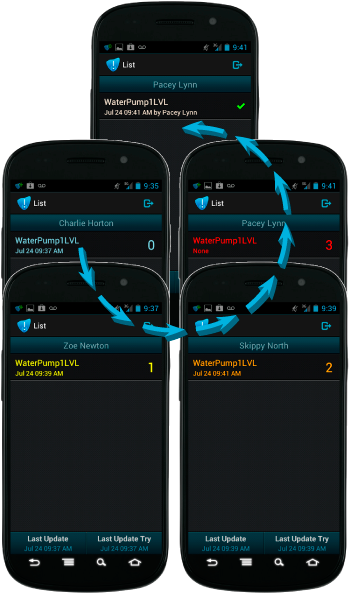 How does SCADA-Aware Mobile handle long tagnames? By grouping or aliasing the tagnames. What OS/platforms does SCADA-Aware Mobile run on? For smartphones – Blackberry (OS5 and OS6), iPhone (iOS 5) and Android (OS2.2 or greater). For PCs, any PC with Windows XP SP3 or newer operating system. 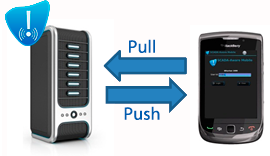 What smartphones does SCADA-Aware Mobile cover? How do you sell SCADA-Aware Mobile? We sell licenses for Event Servers, Secure Proxy Servers and Client Access Licenses (CAL). The Client Software is free and can be installed on ANY number of mobile devices or Windows desktop devices. One Client Access License (CAL) allows ONE user to log in to the SCADA-Aware Mobile system on ANY two devices at the same time (For example, a user’s mobile device AND his/her Windows desktop device). For more on pricing options or to ask for a quote, please call or write to us. What type of customer support does Recursion provide? At Recursion Software, our goal is to deliver software that meets or exceeds established standards of performance and quality to help our customers achieve their business objectives. Our customer support program is designed and implemented with this goal in mind. Incident Reporting: When a customer reports an incident it is logged into the Recursion Software Incident Tracking system and an incident number is generated. Based on the incident type and severity, the customer can expect regular status reports for the duration of the resolution process. Incident Handling: Depending on the assigned severity level, the incidents will be handled through immediate or same day action, short term resolution, resolution in the next Minor Release, or resolution in a Major Release. Incident Escalation: When escalation of the incident is required, the customer can contact the Customer Support Engineer assigned to the problem and request escalation. Afterwards, if required, the customer can request to speak with the Director of Customer Support Engineering. Product Enhancement: If the customer requests an enhancement to a Recursion Software product, Recursion Software Customer Support Engineering will work with the customer to clearly define the proposed enhancement and prepare a development plan. Each enhancement will receive a priority of 1, 2, 3, or 4. Enhancement requests are reviewed internally for possible inclusion in the next release of the software.